“It was 5:14 o’clock in the morning of Wednesday, April 18 . Nearly half a million people on the western edge of the American continent awoke suddenly with a roaring in their ears and a sensation in every nerve that struck indescribable terror to their souls.” On the fateful morning of the San Francisco earthquake, and in the troubling days that followed, more than 3,000 citizens lost their lives. In addition to the tragic loss of human life, the effects of another significant loss have been felt in the 110 years since that disastrous day. 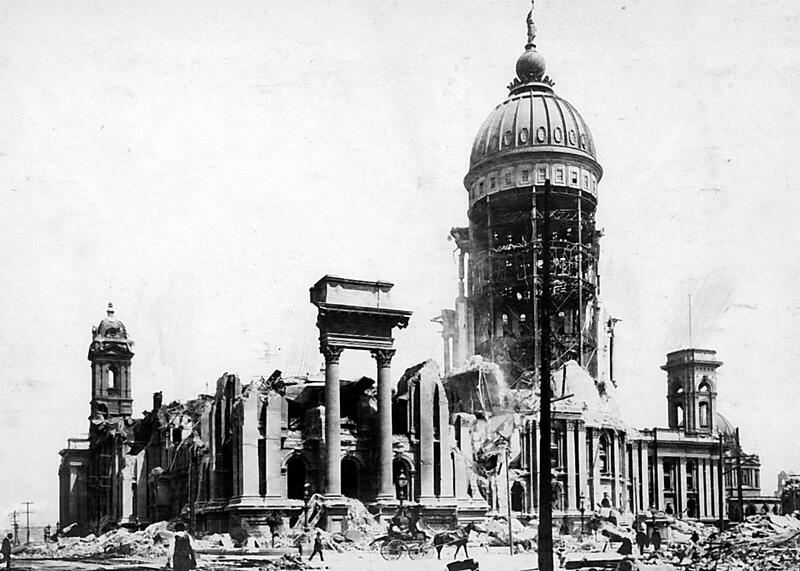 As a result of ruptured gas mains and other structural issues, several massive fires erupted, including one which swept through the San Francisco City Hall and its adjoining Hall of Records. Many of the records housed in this facility were destroyed in the fire, but a portion of the records survived and remain intact today. According to expert Nancy Simons Peterson, a small number of civil death records and many of the city’s deeds survived. Additionally, in some cases, ministers retained church records, giving researchers another avenue to pursue. Over the course of the last century, genealogical researchers have struggled to piece together the remaining records in San Francisco, using what resources are available to fill as many gaps as possible. Unfortunately, more was lost than survived. Death records, many of them unindexed, exist from 8 November 1865 to 30 April 1873, 1 August 1894 to 30 June 1896, and 1 July 1898 to 30 June 1904. Researchers seeking death information for a resident outside of these date ranges have been forced to seek other resources, including parish records, obituaries, and family bibles. Even fewer marriage records survived, with only the indexes from 1 July 1904 to 17 April 1906 remaining. In most cases, if proof of a pre-1904 marriage was required after the earthquake, couples were able to provide enough evidence to have the record re-transcribed. In addition to the church records mentioned above, which are often housed at the church itself, newspaper notices are among the more helpful resources for retrieving genealogical information. The destruction of the Hall of Records allowed many Chinese immigrants to claim residency in San Francisco and American citizenship, allowing them to work around the strict features of the Chinese Exclusion Act and to bring their families into the United States. Following the earthquake, insurance companies faced significant issues, as both policy holders and the companies themselves lost many of their records, so filing a claim related to the earthquake became nearly impossible. The California Genealogical Society also contains a wide range of records relating to the 1906 Earthquake and its impact on genealogy. The last known survivor of the earthquake, William A. “Bill” Del Monte, passed away on 11 January 2016. Del Monte was just three months old at the time of the earthquake and was just eleven days shy of his 110th birthday. Frank Thompson Searight, The Doomed City: A Thrilling Tale (Chicago: Laird and Lee, 1906), p. 14. Nancy Simons Peterson, Raking the Ashes: Genealogical Strategies for Pre-1906 San Francisco Research (San Francisco: Lulu, 2011), p. xi. San Francisco Genealogy Website, Vital Records Information, http://www.sfgenealogy.com/sf/sfranvit.htm. 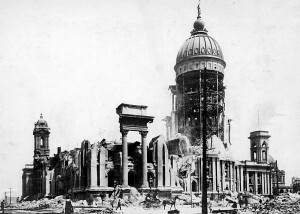 Christoph Strupp, Dealing with Disaster: The San Francisco Earthquake of 1906 (Berkeley, Calif.: University of California, Berkeley, Institute of European Studies, 2006). University of Buffalo, Multidisciplinary Center for Earthquake Engineering Research, “Insurance Industry Struggles with Claims” http://mceer.buffalo.edu/1906_Earthquake/industry_impacts/impact-insurance-industry.asp. Kristin J. Bender, “Last Survivor of 1906 San Francisco Earthquake Dies at 109,” ABC News, 11 January 2016, http://abcnews.go.com/US/wireStory/survivor-1906-san-francisco-earthquake-dead-109-36223112. Thanks for “tipping your hat” to the passing of the last known survivor of the 1906 event, and for mentioning Raking the Ashes by Nancy Peterson and the California Genealogical Society, both Bay Area treasures for finding early local records. CGS also has rich resources for genealogical research in the rest of the United States. Between 1989 and 1991 I compiled a fairly extensive list of sources that survived the earthquake. Many of them have now been identified by the CGS. I’d be happy to compare notes. This is one of many of my incomplete projects. Feel free to contact me through APG. Very interesting! I hope we will see a similar Vita Brevis post about the records lost in the great Chicago fire of 1871.